The Protestant Reformation which occurred 500 years ago was the result of a number of key figures in church history. One of the most significant was John Calvin, whose commitment to the Word of God and glory of God ignited a great revival in the church. Although he was a leader of the Reformation, a theologian, a teacher, and a commentator, John Calvin was first and foremost a preacher. It was to this role that Calvin gave himself most fully in his 25 years as a pastor in Geneva, Switzerland. 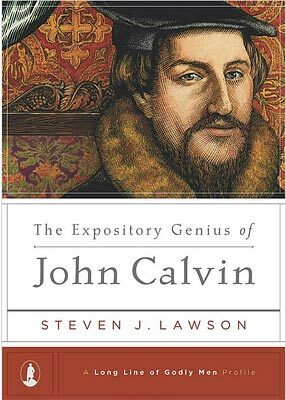 In order to help us appreciate the life and ministry of Calvin, Dr. Steven Lawson delves into what made Calvin’s preaching so effective in his book The Expository Genius of John Calvin. He not only addresses the commitments, practices, and techniques that characterized Calvin’s preaching, but he identifies 32 distinctives of his pulpit ministry that helped him proclaim God’s Word with such clarity and conviction. Since October is Reformation month and since our Reformation Celebration will focus on the life and ministry of John Calvin, this would be a great resource to familiarize yourself with his preaching and know how to evaluate other preaching!